Outside of the truly elite players like Michael Jordan, Kobe Bryant and LeBron James, few current basketball collectibles garner as much interest as Dwyane Wade autograph cards. Wade has long been a collector favorite based on his abilities, personality and winning ways. Injuries and diminished production had many questioning if his best days were behind him, but Wade has come back with a vengeance and the Miami Heat looked primed for another NBA Championship. 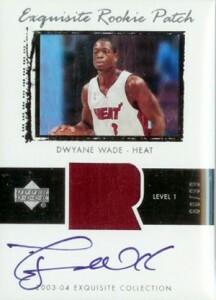 Dwyane Wade autograph cards used to be a very common occurrence in the hobby. 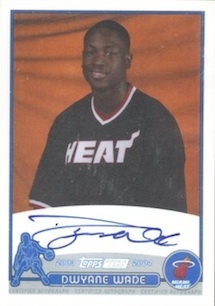 Wade's rookie year, 2003-04, features one of the largest basketball autograph card totals for any season and hundreds more autographs have been released since then. Based on his strong following, Topps signed Wade to a multi-year exclusive deal in 2005. After the 2009-10 season, Topps lost their NBA license. 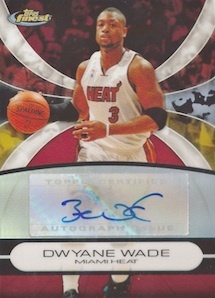 Since Topps still retained their exclusive with Wade, no new autographs were produced for several years. Panini currently holds the sole NBA license among card companies and fans have long been clamoring for new Dwyane Wade autograph cards. 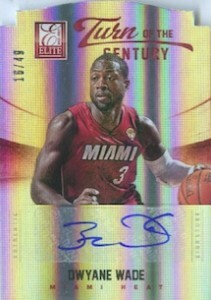 This all changed in 2013, when it was announced that Dwyane Wade autograph cards would be appearing in Panini products. The following ten cards represent some of the best Dwyane Wade autograph cards. While several of the cards are definitely high-end, the purpose of this list is to offer Dwayne Wade autograph card collectors of all budgets the best options for adding to their collection. 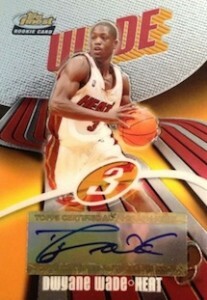 This card is the very first of the Dwyane Wade autograph cards from Panini. Although it features a sticker autograph, the die-cut card is numbered to just 49 and has been selling for over $160. On the other side of the spectrum, this card is one of the very last offerings from Topps. Dominated by a blue background, Dwyane Wade's 2009-10 Bowman 48 autograph card is one of the most plentiful and low-cost options for collectors. Ungraded copies regularly sell for less than $40. Another low-cost option for collectors, Topps Signature was a product that boasted eight autographs per box and one autograph per pack. 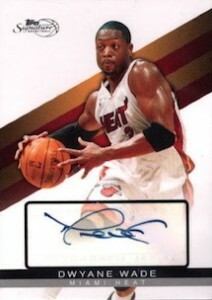 Numbered to 649, this commonly found card is the cheapest certified Dwyane Wade autograph card available. At first glance, this seems like a rather unremarkable autograph card. However, collectors from this time period will know that 2008-09 Finest Basketball was a product that never actually existed. The last full release of Finest basketball came in 2007-08. This card was a special customer service replacement redemption that came directly from Topps. While the print run is unknown, it could be very high as the result of a possible sticker dump by Topps. Regardless, this unique card can normally be found for under $40. 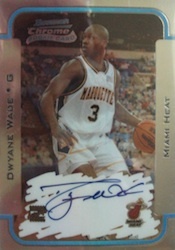 Just like his base Bowman rookie card, Dwyane Wade's 2003-04 Bowman Chrome rookie is not going to win any design awards. However, an on-card signature, as well as a low print run and several refactor parallels, keep it popular with collectors. 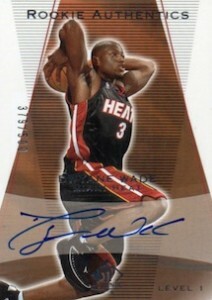 Easily one of the loudest Dwyane Wade autograph cards in existence, 2003-04 Finest features a very colorful card. Despite another sticker autograph and a higher print run, these cards and their refractor parallels remain popular with collectors. While the bronze pyramid background does overshadow the rest of the design, this card receives strong interest based on the on-card autograph and mid-level print run. A "Limited" parallel, numbered #/50, also generates a lot of interest. 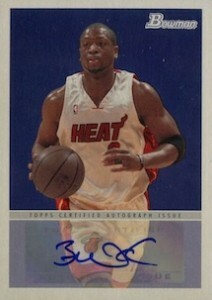 Dwyane Wade's 2003-04 Topps Rookie Photo Shoot autograph card has become highly sought after over the years. While the card it not a true rookie, the simple design, on-card autograph and rarity keep its value squarely in the four figure range. With a stated print run of only 56, these cards do not pop up often. 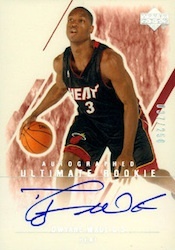 Ultimate Collection nailed the rookie card autograph design in 2003-04. Understated elegance makes this one of the best looking cards on the list, while low numbering and an on-card autograph further enhance this awesome Dwyane Wade autograph card. Like almost any rookie from this iconic product, Dwyane Wade's 2003-04 Exquisite rookie card will always be the top option for collectors who can stomach the cost. The combination of a very limited print run, on-card autograph, jersey piece, and the Exquisite name, sets this card apart from all the other Dwyane Wade autograph cards.